Posted by Teresa Mihelic HelpDesk on Friday, April 19th, 2013 at 12:49pm. Laguna Beach is a beautiful coastal town in Orange County, famous for its art, but most of all for its drop dead gorgeous beaches, and for us, interested in anything real estate related, in the beach front homes and ocean view homes that only Laguna Beach can offer. Many homes (if not most), are custom, making it more exciting for some to search for that special, one of a kind beach front home. South Laguna Beach area : we identify this area as 'South of the Montage Resort' , with popular beaches like 'Thousand Steps' ( it does feel like a thousand steps going down the access to the beach), Table Rock, West Street, Camel Point and the beautiful and scenery area around Aliso Beach Park and Treasure Island Park. Homes here are away from the hustle and bustle of the downtown crowds, with quick access into Dana Point and thus, the 5 Freeway. The Hospital is located in this area too. The picture above was taken at a home close to the 'Thousand Steps' access. What an incredible backyard! Keyhole Arch through Victoria Beach: this area is a very desirable one for those looking for the 'ocean views'. beach front homes off Victoria Beach and Lagunita, gorgeous homes off Nyes Place Street that offer incredible Ocean views. Bluebird Beach area: have you heard of the Surf & Sand Resort? Bluebird Beach is the beach right in front of it, with access from PCH at Bluebird Canyon. This one is a popular one in Laguna Beach within the body boarders and the area is ideally located close to downtown Laguna Beach - or Laguna Beach Village, offering homes within walking distance to the beach, and within minutes to downtown, yet still secluded. Main Beach Area - or downtown Laguna Beach: many beautiful sandy beaches are here, and the heart of Laguna Beach with its Village and many amenities like shops, restaurants, art galleries, that are within walking distance from the homes in this area. The Sawdust festival, the Pageant of the Masters, the Art a Fair Festival and many others are hosted here. Many homes offer gorgeous ocean and Catalina Island views going up into the hills, into the Temple Hills area. North Laguna Beach : this is the area that goes from the Laguna Canyon Road intersection ( 133) to the north boundary with Newport Coast. Many galleries are here and other restaurants. We think of this area as the 'Cove's' as this is where we can find the majority of Coves in Laguna Beach and also here the is the popular neighborhood of Emerald Bay, with is private beach and gorgeous multi million dollar homes. Interested in Laguna Beach? Our agents at Realty Executives OCDreamhomes know and work the Laguna Beach area extensively. 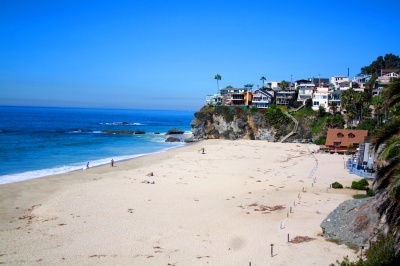 Let us know how we can help you find your perfect 'Laguna Beach Dream Home'.